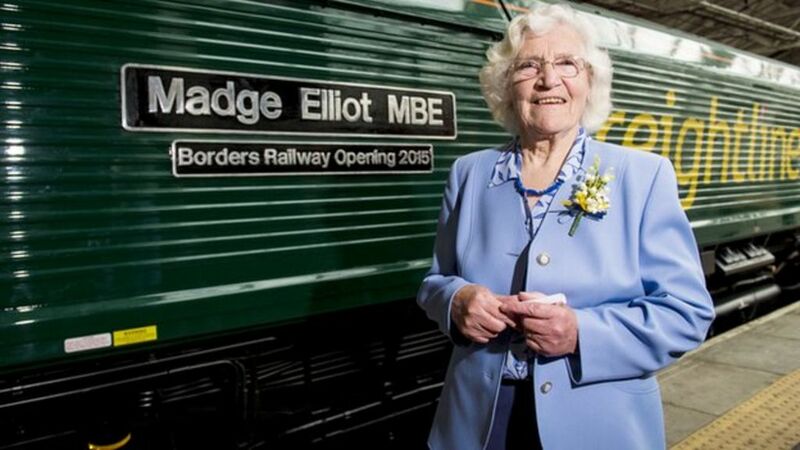 A woman who campaigned for the reopening of a railway in the Borders has had a train named in her honour. Madge Elliot is renowned for her fight to save the Waverley Line, which ran between Edinburgh, Hawick and Carlisle, before it closed in the 1960s. Just 95 days until the first passengers travel on the new Borders Railway, a locomotive bearing her name has been unveiled at Waverley Station. From 6 September, the maintenance train is expected to appear on the new line. A train is named after a woman who campaigned for the reopening of a railway in the Scottish Borders. Scene of a demonstration in Whitehall, SW1, on 18 December 1968, with the Waverley petition party on the march. A young looking David Steel is standing alongside Madge Elliot, with an even younger looking Bruce McCartney holding the placard demanding STOP THE GREAT TRAIN ROBBERY. Some of the original Waverley Route campaigners reunited for the first time in over 40 years at the DS book launch on 23 August. Left to right standing are Andrew Boyd, Chris Harvie and Bruce McCartney, while seated are Kim, Madge and Bob Elliot. The smaller picture shows Madge and Kim in Downing Street during the campaign itself.